Almond, David. My Name is Mina. New York: Delacourt Press, 2010. Print. My Name is Mina is a prequel to Almond’s award winning book Skellig - a work for young adult readers that is very exceptional and magical. It is understandable that Almond would wish to return to the character of Mina who, while not the protagonist of Skellig, provides the narrative with its essential element of magical thinking. Mina brings to Skellig its intense, idiosyncratic intelligence and comprehension of lived personal tragedy that give the book its substance and its characters' motivational credibility and willing credulity in the face of mystery and uncertainty. Almond explores Mina's unquenchable creative fire and curiosity in My Name is Mina and has created an unstructured and visually dynamic narrative to try to capture and communicate her voice. In the broad field of literature for young adults Almond is somewhat of a "writer's writer" - unafraid of experimentation with narrative structure and continuity and adept with the abstract presentation of challenging subject matter such as death, post-traumatic stress disorder and, perhaps most provocatively for young adult readers, the general helplessness of adults in controlling the world and themselves. My Name is Mina is a very mindfully structured book with excellent page design that takes the narrative to another level of resonance. Mina applies her prodigious imagination, fuelled by her staunch autonomy and her mother's whimsical but always reassuring presence, to coping with her father's death. Her adventures real and (perhaps) imagined are terrifying, ecstatic and revelatory visions, all described by Almond with an incisive clarity. Almond bridges the sublime and the mundane, transitioning with intuitive ease from conveying how truly exceptional Mina is to exploring her shortcomings, vanity and failings. It's an astonishingly adept and very intimate exploration of character that communicates an inescapable sense of universality. 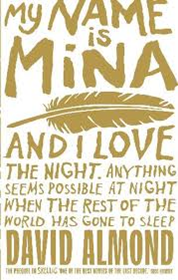 Mina is simultaneously both utterly iconoclastic and completely one with the reader. Matilda spends her days lavishing attention on the University of Alberta’s metadata but children’s illustrated books, literature for young adults and graphic novels also make her heart sing. Her reviews benefit from the critical influence of a four year old daughter and a one year old son – both geniuses. Matilda’s super power is the ability to read comic books aloud.